So you’re using Business Intelligence… but are you? As business owners, managers, and IT professionals, we know what business intelligence is. It’s a way of using technology to make our valuable data interact with us as decision makers so we can understand it better and gain valuable insights. We can even manipulate the way the data is presented, recombine it, and drill down into it. We’ve become comfortable with the idea that our data is more than just a bunch of records being warehoused on our server. Using the data to gauge and predict customer behavior, instead of just maintain customer history, has become commonplace. We’re now used to thinking of data as something that can be analysed using technological tools, and we’ve started to expect useful reports on demand. We may even think of business intelligence as part of the essential toolkit of the executive decision-maker. So what’s wrong with that? Well, nothing, except the word “executive”. In the past couple of years, data professionals have realised that everyone at every level of business makes decisions, and that decisions always require good data. For example, HR professionals use business intelligence to track employee development and identify areas where people may need support. Line workers use business intelligence tools to monitor their machines and their own performance metrics in real time. Help desk analysts use business intelligence to understand early signs of trouble in the systems they support, or evidence that users need training in specific areas, based on ticket categories and volumes. 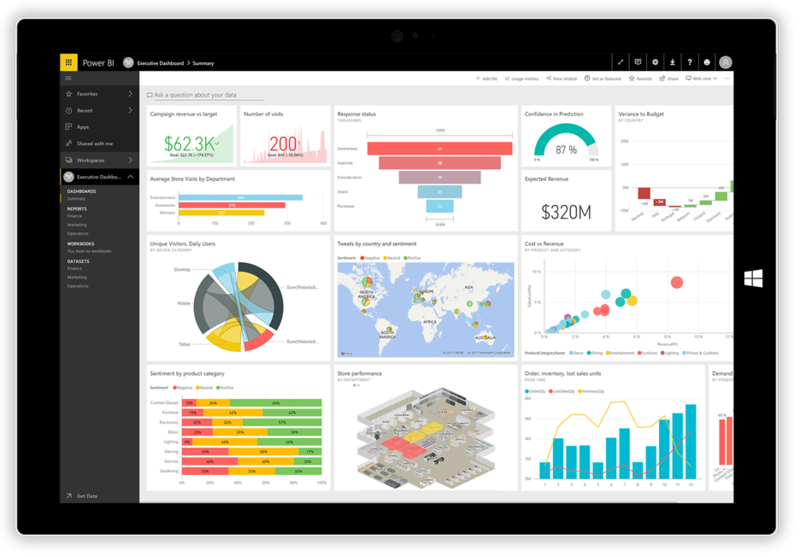 A business isn’t really using BI to its full potential unless the whole business is using it. The idea that business intelligence is a tool for everyone in a business is called data democratisation. Boris Evelson, VP and Principal Analyst at Forrester Research, includes data democratisation in a model he calls Systems of Insight. Evelson defines Systems of Insight as the business discipline and technology to harness insights and consistently turn data into action. © 2015 Forrester Research, Inc. Early BI and data analytics belonged mainly to the IT department, and they used only the data that business management requested them to report on. There was a disconnect between the decision-maker and the data, because everything was filtered through the report-maker. 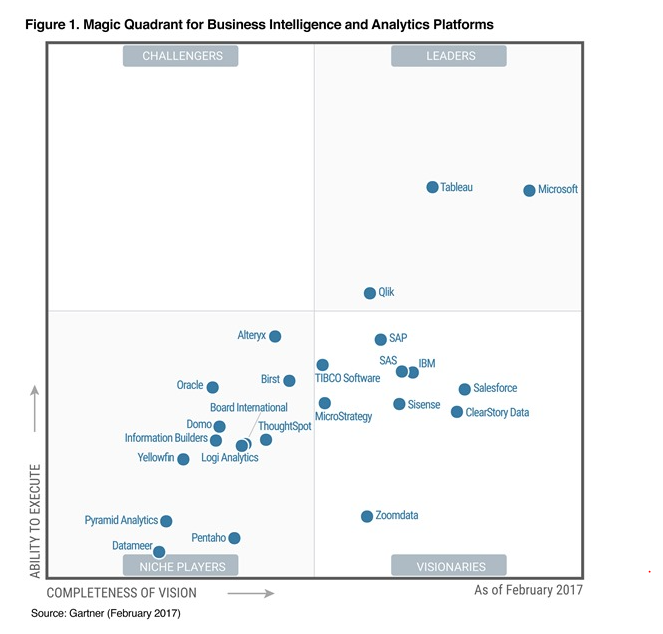 Agile BI began to close the gap between the decision-maker and the report dashboard, giving the decision-maker hands-on, self-service, analytics capability. Big Data enabled businesses to store more data, access it faster, and deliver it in more and better ways. 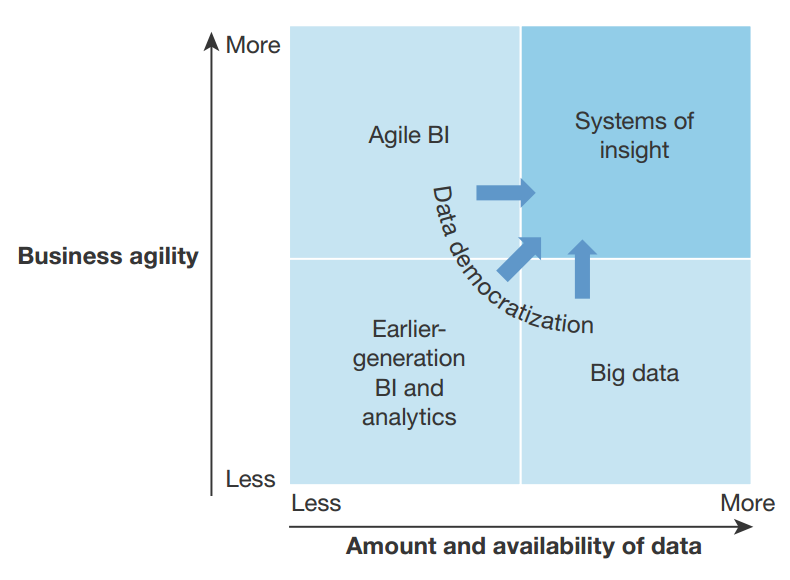 Systems of Insight provide a context for Agile BI and Big Data to work synergistically, so that the massive quantity of data produced by a modern business can be packaged in the right way and delivered at the right time to the specific people who actually need to interpret, interact with, and act on it. To make best use of business intelligence, it needs to be in the hands of the front line. Instead of leaving it in “technology centers”, executives need to make the technology available to and “embed these initiatives and budgets in revenue-generating departments”. He proposes that C-level executives take ownership of the systems of insight, with the CIO responsible for support and empowerment. Data professionals need to allow data users more say in how to present the data. Naturally data pros will construct dashboards and reports for beginners, for critical uses, and for those who wish to maintain a primarily high-level understanding of their data. But as users become more knowledgeable in using these tools, they will become more sophisticated and demanding about exactly how they want to configure them. It will be time for the data pros to become facilitators, mentors, and troubleshooters as they enable users “to tackle the majority of their BI requirements and get their own insights”. Data professionals must also use their experience and expertise to help their BI users “evolve into insights teams”. Evelson points out that users have been conditioned to blame the technology itself for their inability to use it. One reason for this is the mistrust that data pros have historically had for users, keeping the information and the technology “behind closed doors in a private office”. But they’re protecting the data from the people best positioned to understand it. We’ve all probably seen database professionals act as though the data is too brittle to withstand handling. This is often as silly as expecting an Internet user to break a website by Googling it. But business users, who are the decision makers, won’t “break the database” by using analysis and BI tools. They can’t use their own experience and expertise to generate critical insights unless they are given free play in their own data. If BI is embedded into everyday operations, then it can suggest correlations and conclusions that they might not otherwise see or be able to act upon. Decision makers at all levels need BI tools, and the Systems of Insight model, to help them understand the market, their business, their own jobs, and their customers’ expectations and behavior. Caldere is here to help businesses of all sizes, and all of the people in them, understand how to implement and learn the technology of business intelligence. Our professionals have the right experience, the right tools, and the right approach to getting you in touch with your business data in ways you have never thought of before. Contact Caldere to find out how easy and cost-effective these insightful solutions can be for you and your business.